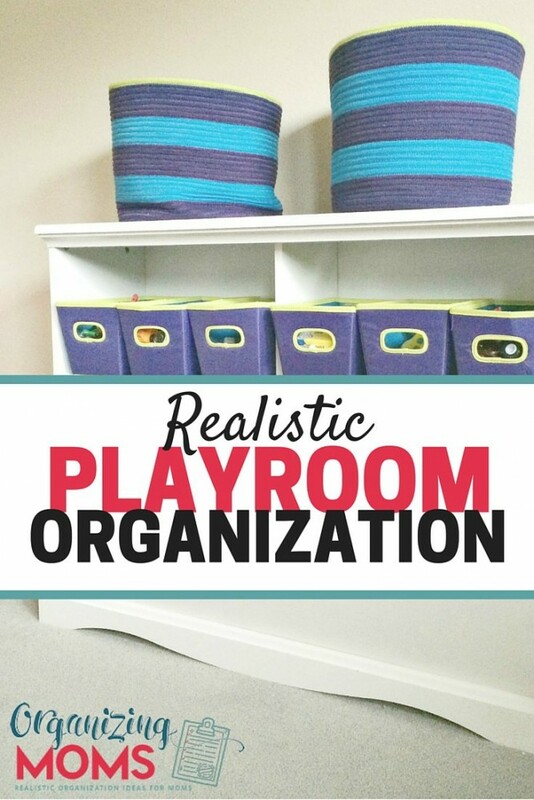 I can’t pretend to have all of the answers to the question of how to best keep a playroom organized. Ours gets out-of-control on a daily basis. The only time it stays neat and organized is when we’re not home. 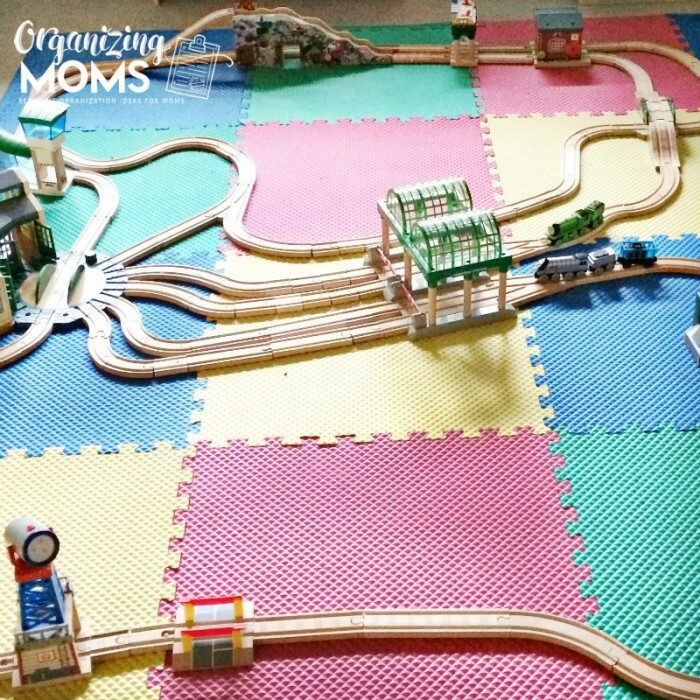 Even though our playroom goes from organized to chaos every single day, there are some things that we’ve done that have helped us reign in the mess. Don’t expect perfection. It’s not going to happen. I want our playroom to be a place where our kiddos can have fun, be creative, and learn through play. I’m just not going to stress myself out by flying off the handle every time there’s a toy(s) left out. We’ll take care of putting stuff away in #10. Store things in baskets and bins. 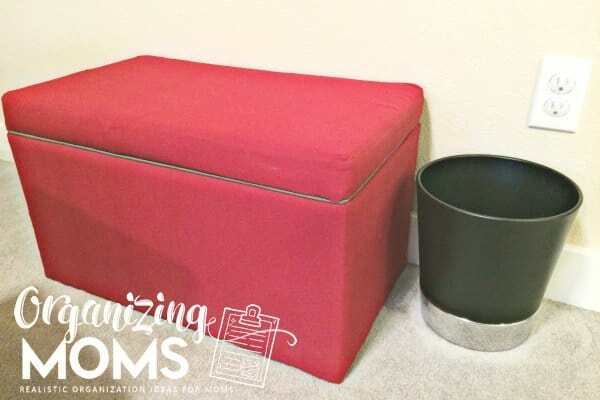 When our sons were younger, I was all about using soft storage containers so they wouldn’t hurt themselves when trying to take out or put away toys. Now that the kids are older, I don’t worry about that so much. 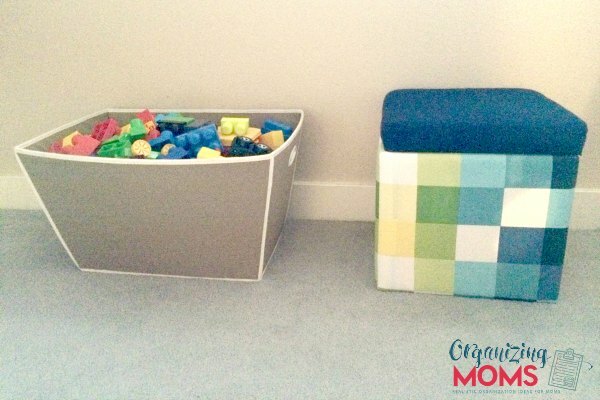 But, having easily-accessible baskets and bins has made it much easier for our kids to put away their toys. Consider NOT labeling everything. 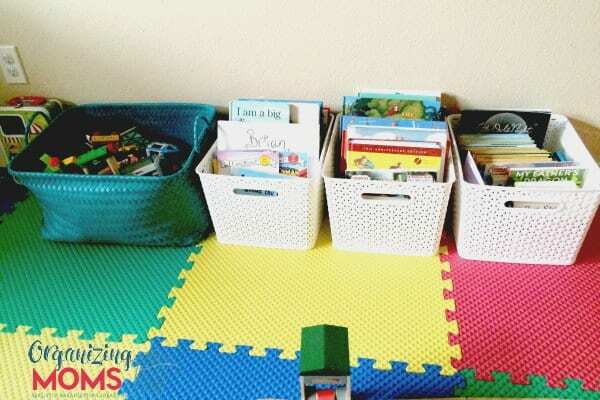 Most playroom organization tutorials recommend putting pictures on all of your bins so kids will know how to put things away. To me, that seemed complicated, and I didn’t want to make new labels every time our kids hit another developmental milestone and started playing with new toys. We try to store toys by category, but sometimes they get commingled. We have all survived. I love to label things, but in our playroom it’s easier for all of us when we don’t. Invest in kid-friendly shelving if you have space for it. We purchased a couple of shelves that have cubbies built in as the bottom shelf. They’re great for storing oversized toys like big trucks. Rotate toys. We have several toys that are stored in opaque (non see-through!) bins. When we bring them out of storage, they’re like brand-new toys to our kids. If, when we bring them out of storage, our kids are no longer interested in them, we know we can get rid of them. Use seating that doubles as storage. We picked up a few storage ottomans, and we’ve used them to store all kinds of toys over the years. The kids don’t sit on them a lot, but they sure are nice for adults who can’t get down on the floor easily. Display children’s artwork in the playroom. It adds color to the walls, and it looks much nicer than if we put artwork on the refrigerator. We use pants hangers to hang the artwork so it’s easy to change what’s on display. Consider using foam flooring in part of the playroom. It’s soft, yet more durable than carpet. It makes a nice play surface for blocks or trains, and it’s easy to clean up. We’ve had our foam flooring down for a while, and it’s saved me hours of work in cleaning up “accidents” on the carpet. Declutter junky toys. Somehow we acquire more freebie toys all the time. I “rescue” them once there abandoned, and save them in a box in my closet. If the kids ask about the junky toys, I know where to find them. Usually, they’re out-of-sight, out-of-mind. Once it’s full, I plan on donating the box to a teacher who uses a treasure reward system in the classroom. Do big pickups. Every day or so, we completely pick up the playroom. The kids like showing off their clean playroom when they’re done, and it just works for us. I know a lot of parents recommend making kids put stuff away when they get out something new. If that works for you, stick with it. It didn’t work for us, so we implemented the big pickups. So, that’s how we’ve kept our playroom somewhat organized. It works for us now, but I have a feeling that we will need to start labeling bins as the toys get smaller and more intricate. 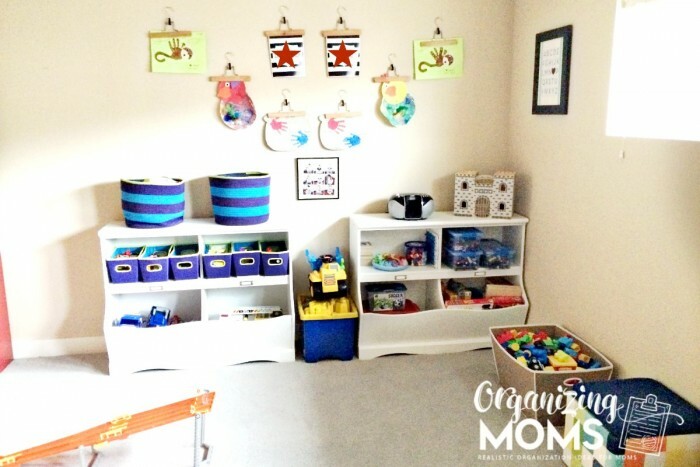 Do you have any playroom organization tips to share? 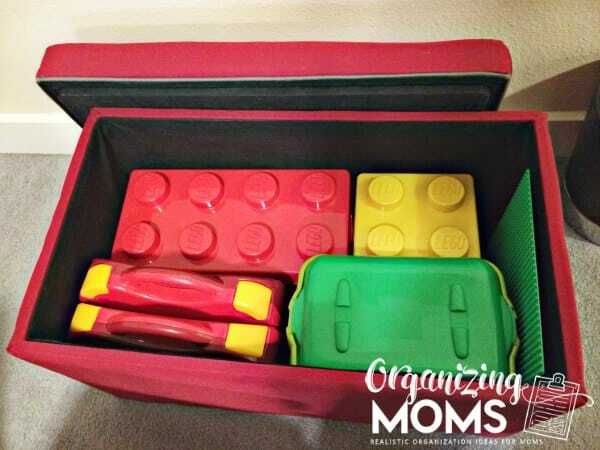 How to Organize All The Legos! 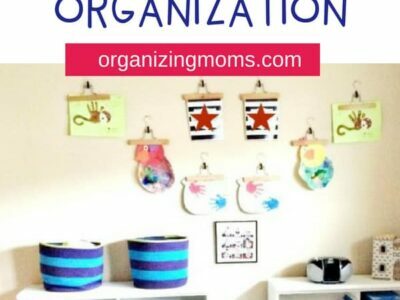 How to Organize Your Home – 30+ Ideas! My favorite toy storage solution is the Sauder Pogo bookcase. I bought it off of Amazon a few years ago, and it’s made it through several moves, several Nerf gun battles, and who knows what else. 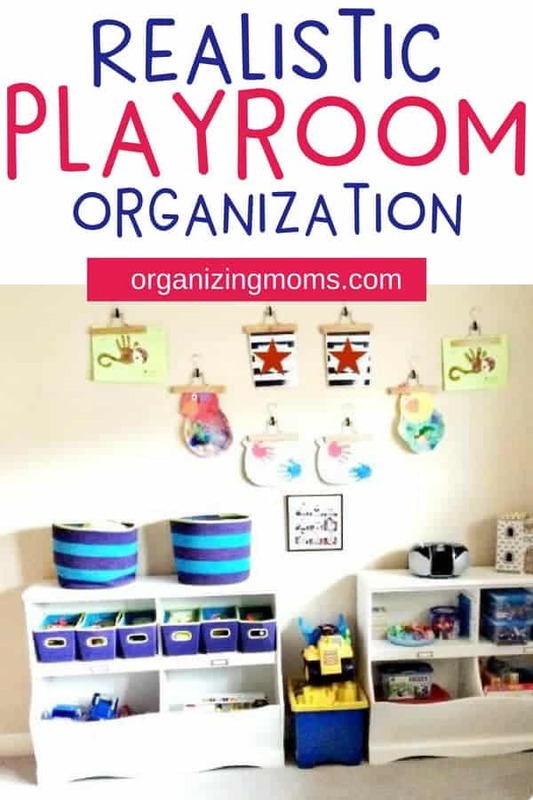 We have two in our playroom, and they’re super versatile and easy for our kids to use. 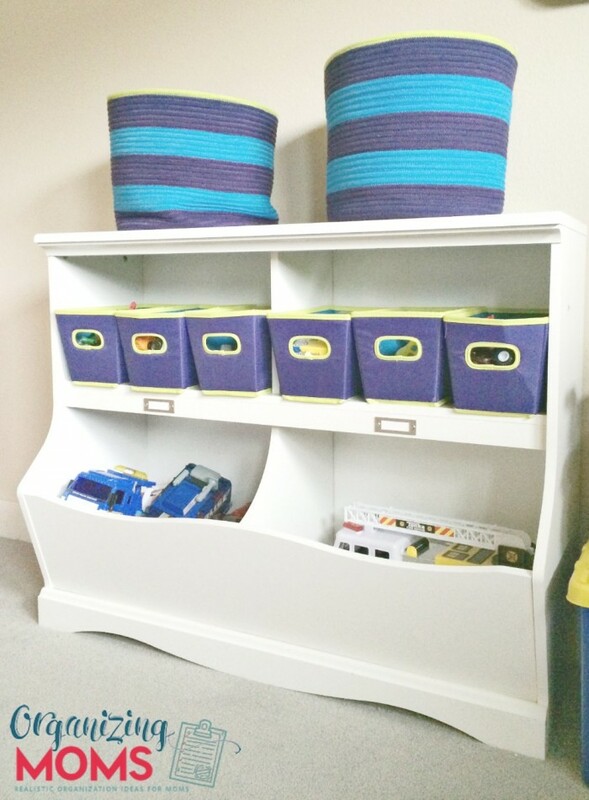 Go here to learn more about this toy storage shelf.